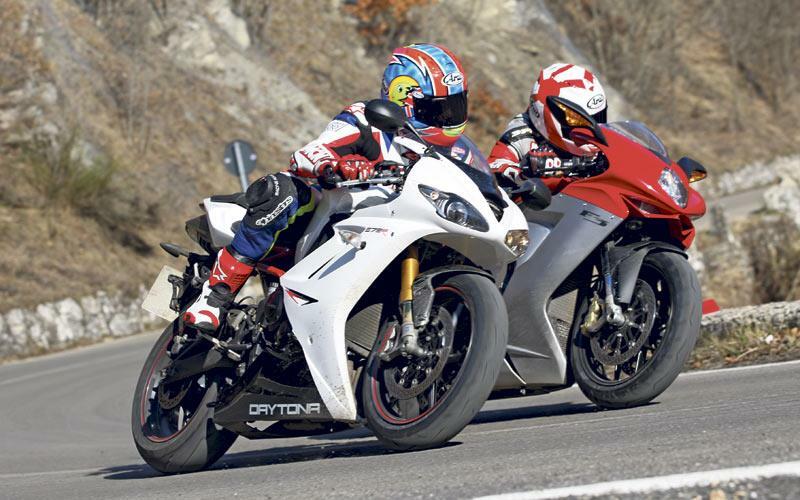 The new three-cylinder 675cc MV Agusta F3 is the lightest, most powerful and electronically advanced supersport machine on the road, but does all that make it any better than the Triumph Daytona 675R? The Triumph can't compete with the tecnology of the F3, but it does come with Ohlins suspension, Brembo brakes and a quickshifter. To find out which is the best three-cylinder supersport, MCN took both bikes to northern Italy and put them through their paces on the twisting mountain roads. See how the bikes stack up against each other below, and read the full test in the March 7 issue of MCN. Pros Looks, noise, low weight, handling on smooth roads, power. Looks, noise, linear power delivery, handling, braking and easy to ride. Cons Erratic power delivery, over-complicated riding modes, skittish on bumpy roads. Lacks outright acceleration compared to F3.